Download "SEAT PAGINE GIALLE S.P.A. 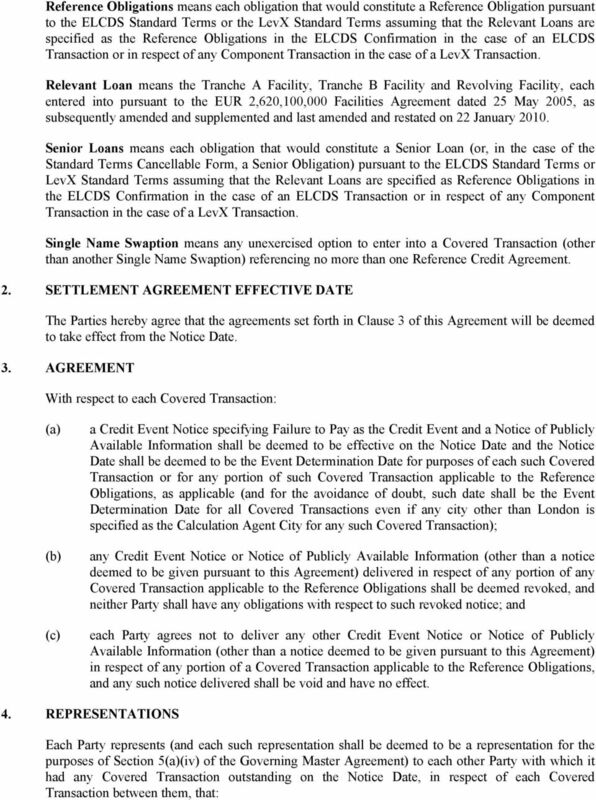 UNIFORM ELCDS SETTLEMENT AGREEMENT"
4 (v) (vi) the Scheduled Termination Date is on or after the Default Date; and in respect of a Covered Transaction which references more than one Reference Credit Agreement, any portion thereof attributable to the relevant Reference Obligations is still outstanding as of the Notice Date. Default Date means 3 January Documentation means the Governing Master Agreement and Confirmation (including a master confirmation) relating to a Covered Transaction. ELCDS Confirmation means the form of confirmation for use with the ELCDS Standard Terms or any predecessor thereof. 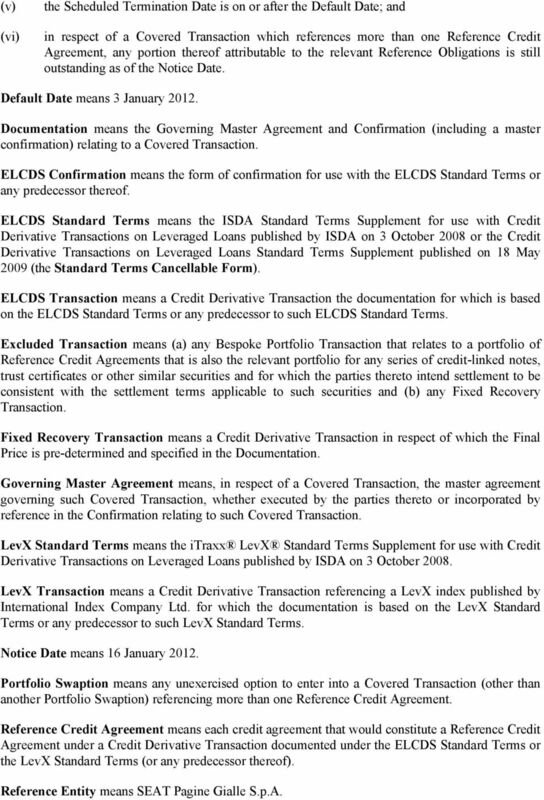 ELCDS Standard Terms means the ISDA Standard Terms Supplement for use with Credit Derivative Transactions on Leveraged Loans published by ISDA on 3 October 2008 or the Credit Derivative Transactions on Leveraged Loans Standard Terms Supplement published on 18 May 2009 (the Standard Terms Cancellable Form). ELCDS Transaction means a Credit Derivative Transaction the documentation for which is based on the ELCDS Standard Terms or any predecessor to such ELCDS Standard Terms. Excluded Transaction means (a) any Bespoke Portfolio Transaction that relates to a portfolio of Reference Credit Agreements that is also the relevant portfolio for any series of credit-linked notes, trust certificates or other similar securities and for which the parties thereto intend settlement to be consistent with the settlement terms applicable to such securities and (b) any Fixed Recovery Transaction. Fixed Recovery Transaction means a Credit Derivative Transaction in respect of which the Final Price is pre-determined and specified in the Documentation. Governing Master Agreement means, in respect of a Covered Transaction, the master agreement governing such Covered Transaction, whether executed by the parties thereto or incorporated by reference in the Confirmation relating to such Covered Transaction. LevX Standard Terms means the itraxx LevX Standard Terms Supplement for use with Credit Derivative Transactions on Leveraged Loans published by ISDA on 3 October LevX Transaction means a Credit Derivative Transaction referencing a LevX index published by International Index Company Ltd. for which the documentation is based on the LevX Standard Terms or any predecessor to such LevX Standard Terms. Notice Date means 16 January Portfolio Swaption means any unexercised option to enter into a Covered Transaction (other than another Portfolio Swaption) referencing more than one Reference Credit Agreement. 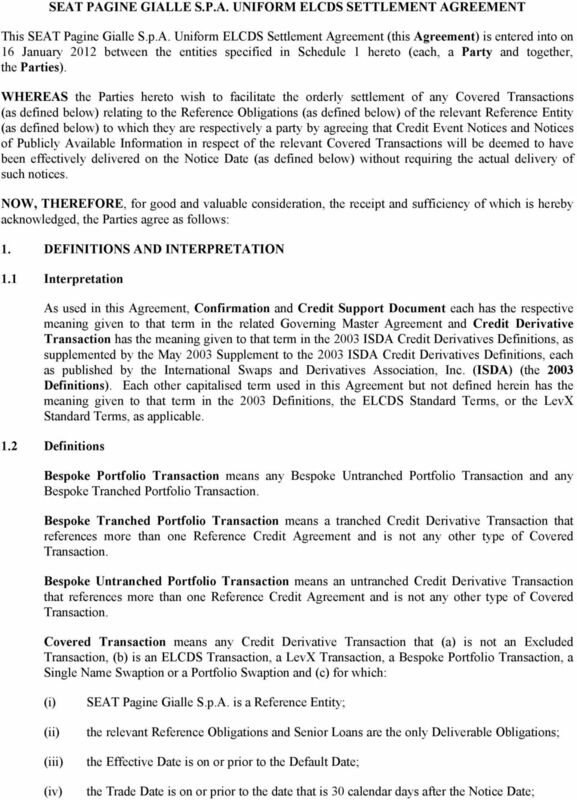 Reference Credit Agreement means each credit agreement that would constitute a Reference Credit Agreement under a Credit Derivative Transaction documented under the ELCDS Standard Terms or the LevX Standard Terms (or any predecessor thereof). Reference Entity means SEAT Pagine Gialle S.p.A.
7 waives all rights and remedies which might otherwise be available to it in respect thereof, except that nothing in this Agreement will limit or exclude any liability of a Party for fraud. 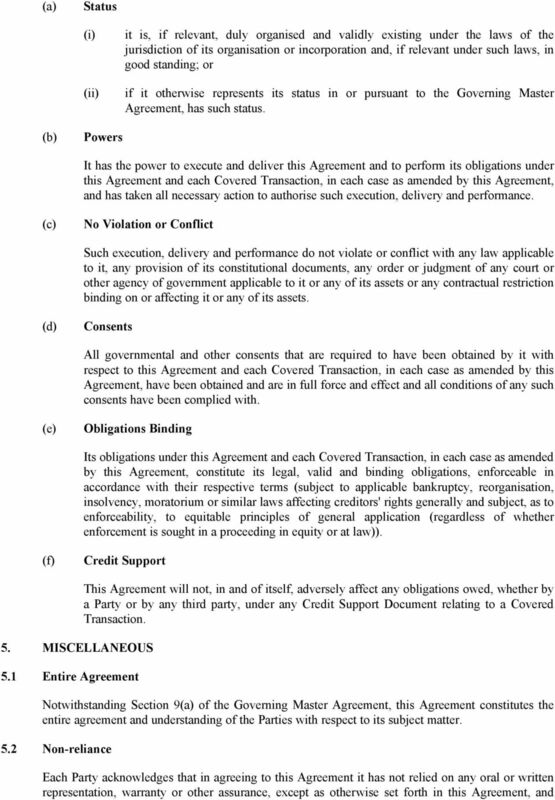 5.3 No Waiver Except as explicitly stated in this Agreement, nothing herein shall constitute a waiver or release of any rights of any Party under the Documentation for the relevant Covered Transaction. 5.4 Amendments An amendment, modification or waiver in respect of the matters contemplated by this Agreement will only be effective if made in accordance with the terms of the Governing Master Agreement and then only with effect between the parties to that Governing Master Agreement (and will only be effective to amend or override the provisions contained in Clause 3 hereof if it expressly refers in writing to this Clause 5.4 of this Agreement and would otherwise be effective in accordance with Section 9(b) of the Governing Master Agreement). 5.5 Headings The headings used in this Agreement are for convenience of reference only and are not to affect the construction of or to be taken into consideration in interpreting this Agreement. 5.6 Governing Law This Agreement will be governed by and construed in accordance with English law and as between two Parties and in respect of each Covered Transaction between them, the giving of notices deemed to occur under that Covered Transaction pursuant to this Agreement shall be governed by and construed in accordance with the law specified to govern that Covered Transaction and otherwise in accordance with applicable choice of law doctrine. 5.7 Counterparts This Agreement (and each amendment, modification and waiver in respect of it) may be executed and delivered in any number of counterparts (including by facsimile transmission) and all of such counterparts taken together shall be deemed to constitute one and the same instrument. 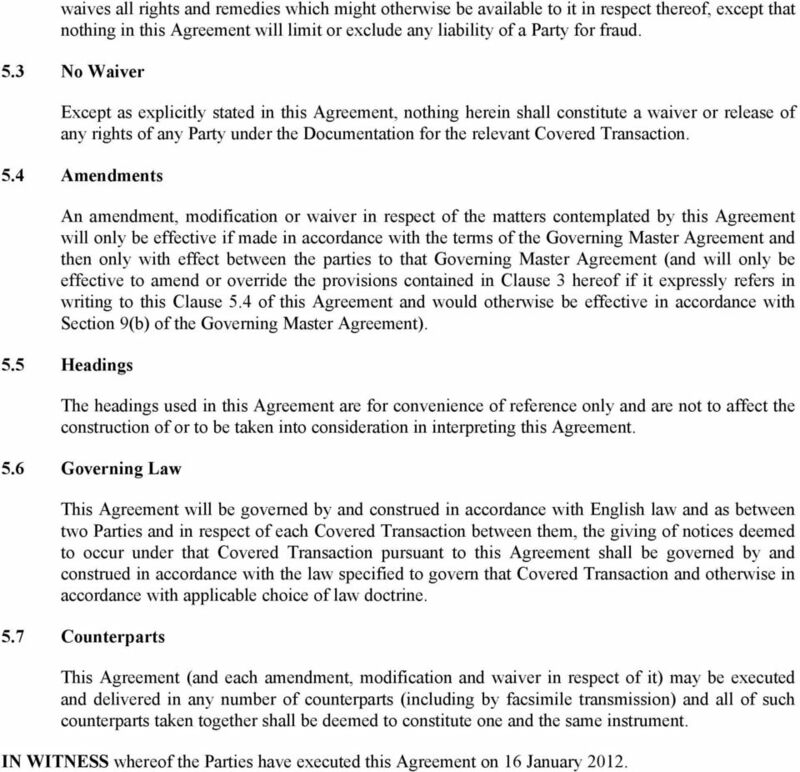 IN WITNESS whereof the Parties have executed this Agreement on 16 January 2012. 8 SCHEDULE 1 PARTIES Each of the following entities is a Party to this Agreement: Legal name of Party 1 DTCC Account # (if any) 1 Specify legal name of Party. If you are an investment or asset manager and act on behalf of multiple funds, you may indicate in the signature block, "Investment/Asset Manager, acting on behalf of each of the funds and accounts listed in the relevant Master Agreement between it and another Party" (or such other language that indicates the funds to which this letter is applicable). A separate signature page for each fund does not need to be submitted to ISDA. ISDA. International Swaps and Derivatives Association, Inc. AMENDMENT 1. dated as of.. to the ISDA MASTER AGREEMENT. between. and. The logo on this form may have been updated. 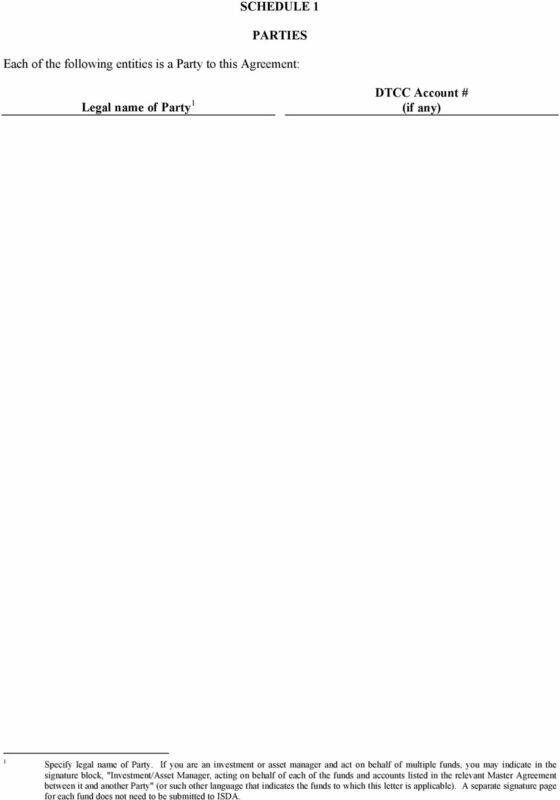 The content of this document has not been modified since its original website posting. 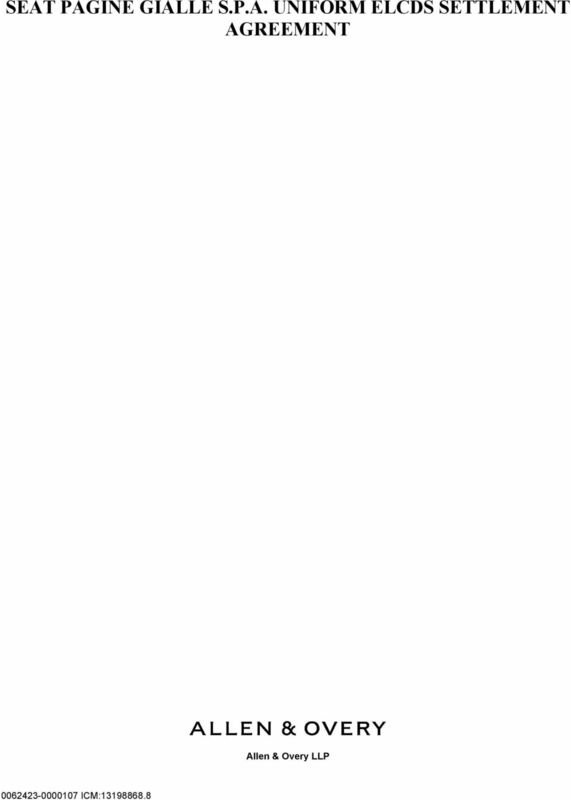 Execution Version MANAGEMENT AND ADMINISTRATIVE SERVICES AGREEMENT between Seadrill Management AS and Seadrill Partners LLC US 1475972v.11 CONTENTS Clause Page 1. APPOINTMENT AND EFFECTIVE DATE...1 2.